Matching second nightstand and accessories available, configure below. The Briana bedroom collection by Coaster weaves together simplistic styling with elegant contemporary design. The glossy black finish flows dramatically over the gentle curves and simple lines of each piece. The collection features a bed, nightstand, dresser, mirror, chest, and TV dresser. 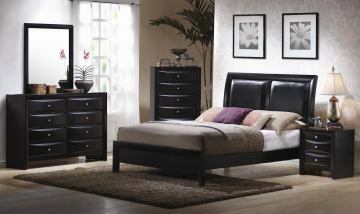 The sophisticated platform bed features a tailored headboard with modern double inserts in black by-cast leather. The gentle curved headboard offers a comfortable place to sit and relax while reading in bed. The nightstand features simple lines and three drawers to store accessories and personal items. The double dresser has eight spacious drawers to store folded shirts, pants, and accessories. The strait edges, beveled drawer fronts and simplistic stainless steel hardware accentuate its clean design. 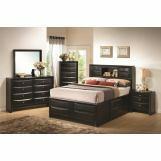 The contemporary beauty of this distinctive bedroom set is sure to add style and modern elegance to your interior décor. 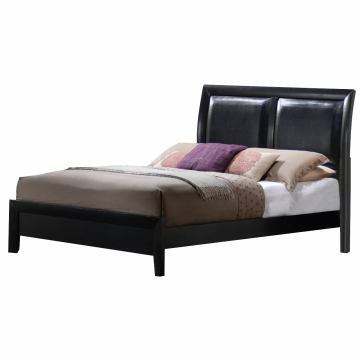 This sophisticated platform bed features a tailored headboard with modern double inserts in black by-cast leather. 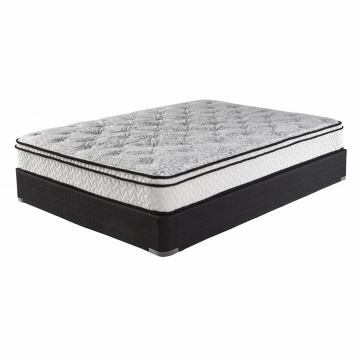 The gentle curved headboard offers a comfortable place to sit and relax while reading in bed. 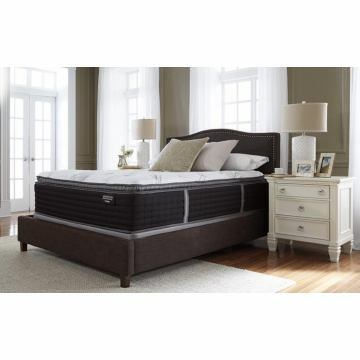 The glossy black finish flows dramatically over the flowing curves and simple lines of this elegant bed. This contemporary nightstand features simple lines and three drawers to store accessories and personal items. The strait edges, beveled drawer fronts and simplistic stainless steel hardware accentuate its clean design. The glossy black finish flows dramatically over the gentle curves and simple lines. 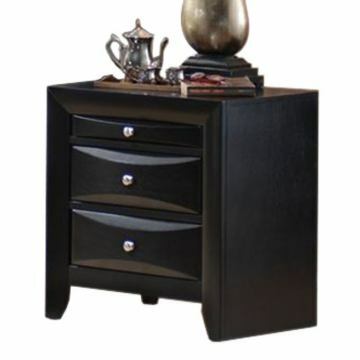 This stylish and modern nightstand will make a great accent for your guest or master bedroom. This contemporary dresser offers eight spacious drawers to store folded shirts, pants, and accessories. The strait edges, beveled drawer fronts and simplistic stainless steel hardware accentuate its clean design. The glossy black finish flows dramatically over the gentle curves and simple lines. 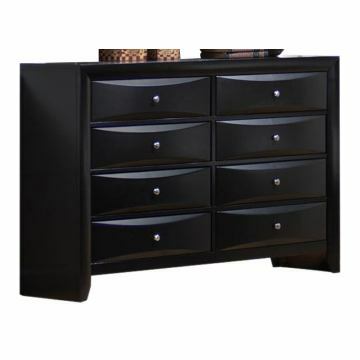 This stylish and modern dresser will make a great design anchor in your guest or master bedroom. 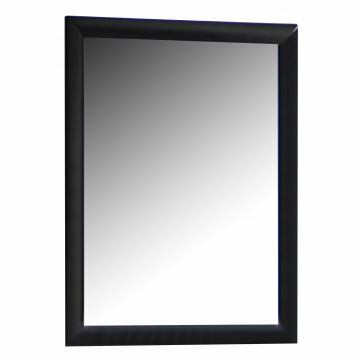 This contemporary mirror features a glossy black finish that accentuates the simple lines and clean design. The large mirror surface reflects the light and adds a sense of openness in the room. Coordinates beautifully with the Briana dresser. Dimensions: 31" W x 17" D x 48 1/2"
This contemporary chest offers several spacious drawers to store folded shirts, pants, and accessories. The strait edges, beveled drawer fronts and simplistic stainless steel hardware accentuate its clean design. The glossy black finish flows dramatically over the gentle curves and simple lines. 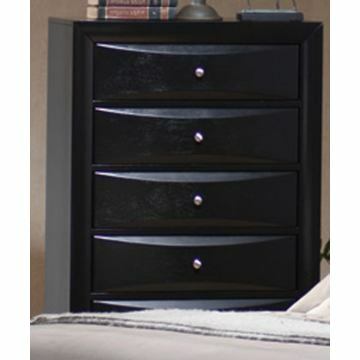 This beautiful chest will add elegance and modern styling to your bedroom. This Briana Collection item features a video.